Women's Day on March 8 gives us all a mandate to examine our progress, and to reflect on our values, ideals, and plans for ourselves and our societies. Norway is regularly nominated as one of the best and most equal countries to live in the world. Norway's achievements can be accredited to the strong emphasis on an equal society, a cross-sectorial political will and ability to make bold political decisions to set the connections between working, family, welfare, and gender equality. More women in the labour force are linked to better economic performance (Women, Work and the Economy,IMF,2013). Aguirre and others (2012) suggest that raising the female labour force participation rate to country-specific male levels would, for instance, raise GDP in the United States by 5 percent, in Japan by 9 percent, in the United Arab Emirates by 12 percent, and in Egypt by 34 percent. Based on International Labour Organization (ILO) data, Aguirre and others (2012) estimate that 865 million women worldwide have the potential to contribute more fully to their national economies. In Norway, men and women are formally on equal footing: the same laws protect them, they have equal access to education, health, social services, and the same opportunities in the workforce. 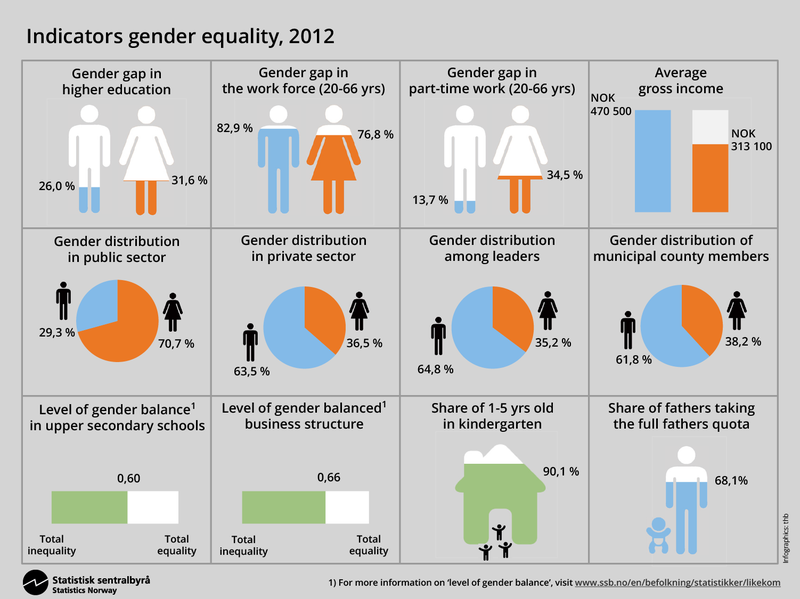 While Norway should be proud of these accomplishments, there are still challenges to obtain a real equality between genders reflected in life choices combined with opportunities. Despite the fight for equal opportunity, women are still earning less than men do, working part-time more than men do, have fewer power positions, are under-represented in municipal politics, and are choosing to stay at home longer which in its turn affects professional careers. Ethnic Norwegian men dominate in positions of power in most sectors of Norwegian society. Formal equality is about equal opportunities to participate, and to make the choices that affect your life. Real equality is about equal distribution of participation, resources, power and responsibilities. To correct the gender imbalance Norwegian governments have, through more than two generations, implemented affirmative action schemes. Norway's 1978 Gender Equality Act aimed to increased women's representations in the public sector. The Anti-Discrimination Ombud Act prevented discrimination based on gender ethnicity, religion. Through monitoring Norwegian law and administrative practice, in 2006, Norwegian legislated a 40 per cent quota for both women and men on public limited boards. Each of these laws are a testament to political will and have been hugely successful. Yet, when asked if everyone has the same opportunity to make his or her own choices, regardless of gender -- it is difficult to provide a clear answer. Why? Because apparently, and this is my own analysis, both historical conditions, the welfare system with roots in post-war Norway, and strong traditions and values have made it difficult for "real" equality to take place. Also, let us not underestimate the individual choices that women take, in their own life projects. 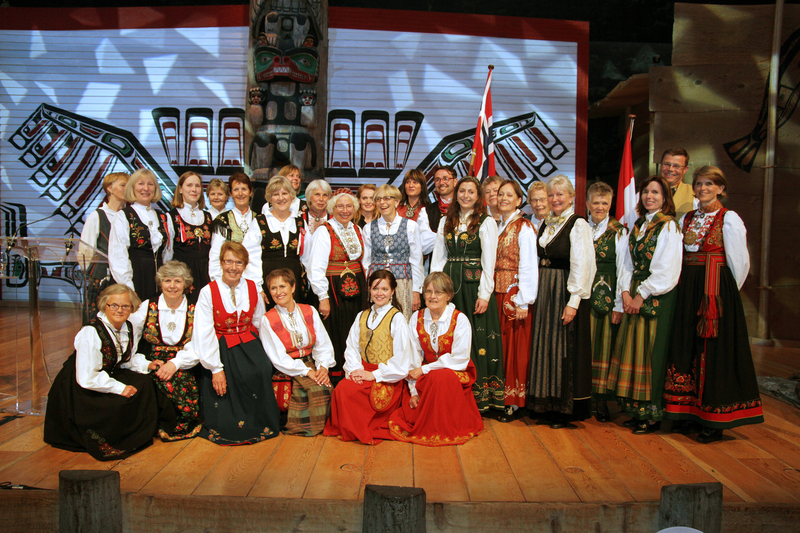 Culture and tradition are important to Norwegian women. Traditional activities such as knitting, sewing, crocheting, cooking, are building blocks of our identity. We pride ourselves in practicing and perpetuating the traditions that belong to the homemaker. "Rose" blogs have thousands of followers in Norway, mainly among the younger generation. Most Norwegian women value these aspects of life in line with our professional life. 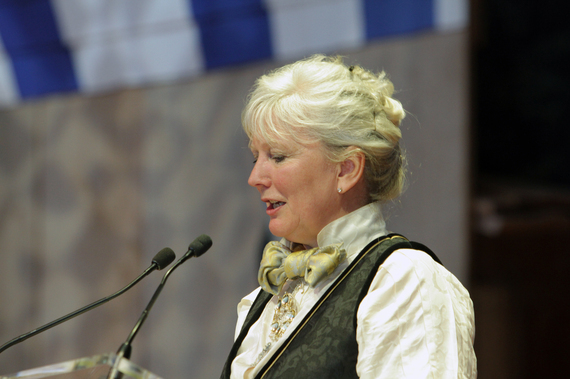 The bunad is a Norwegian traditional costume worn by men and women alike for celebrations or on special occasions. Traditionally, bunads represent an individual's area of origin or family roots. Above is a group of Norwegian professionals dressed up to celebrate the 17th of May (Norwegian National Day) in Ottawa 2014. Family life -- more fathers at home, but women stay at home longer. The Norwegian welfare system ensures childcare and parental leave. These measures have been crucial for the dual career family policy. As a result, we have one of the highest birth rates in Europe -- every woman gives birth to 1.78 children on average during her lifetime. Fathers are allotted 10 weeks of parental leave. This is to strengthen the fathers' relationships with their children and to signal the need for fathers to participate in childcare -- 68 per cent of fathers take their full quota or more. Women take the most the parental leave; the full period is 49 weeks with full pay. For many women, the stay at home is longer. The government offers a cash-for-care benefit to parents who decline public day care facilities until the child is two years old. More women choose this route. In 2011, 84 per cent of those receiving the benefit were women (Ellingsæter 2012). This means that some women have been out of the workforce for 2 years, while men have only been out for 10 weeks. The entry of women into positions of power and decision-making in society is important for the development of a democratic and egalitarian society. Most political parties have introduced gender quotas. In the 2013 national election, women gained 39.6 per cent of the seats in the parliament. In local government, women occupy about one third of the seats. Women's labour market participation in Norway is among the highest in Europe. However, women still earn 86 per cent of a man's wage. Women make up 71 percent of the public sector and 34 per cent of women work part-time, compared to 14 percent men. Despite working part-time, the share of women working outside regular hours has gradually decreased in the last seven years. Work hours are upheld and respected; most employees can, if they choose to, leave their work place at 4 o'clock sharp. This makes it possible for mothers and fathers to pick up children in kindergartens and attend their needs for activities and other support in the afternoon. A split income taxation scheme was established in Norway more than two generations ago. This means that two different taxation schemes (tax class 1 & 2) exist depending on family income -- a scheme derived from a time when married couples were generally considered as one unit. It favoured couples with one income, or with one higher and one very low income in the family. Today, the taxation schemes to a much larger degree is individual-based. All political parties have agreed, with one exception, to abolish the old split income scheme for good. The main reasoning behind this suggestion is that differentiated taxation schemes weaken the incentives for stay-at-home persons, mostly women, to enter the labour market. In 2014, the labour force participation rate among women was 68.4 per cent, compared to 73.4 per cent men (ssb.no). To take away the two-leveled taxation will stimulate women's participation in the work force, and in addition help the integration of immigrant women. Participation in the work force is low amongst female immigrants, demonstrated by the fact that 70 per cent of couples benefiting from the taxation scheme two were couples with at least one immigrant. General opinion is that the Norwegian split income scheme is not suitable to more varied family patterns. Non-married couples have never benefited, for example. Even though the majority of parties desires the end of discrimination against two-income families, a change of the law is yet to be passed in parliament. Gender equality and the welfare state are mutually inclusive -- the welfare state is a precondition for gender equality and gender equality is necessary to develop and maintain the welfare state. 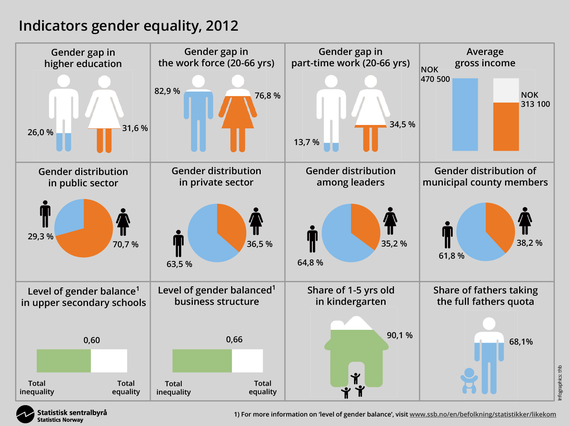 Yet, Norway continues to face challenges to achieve "real" gender equality. On a structural level, we can ask that more gender equality specific policies be put in place, as outlined in the Norwegian government's 2014 equality plan. However, these are also social and political issues -- the reconciliation of work and family, single parenthood and work, unequal pay, involuntary underemployment among women, discrimination on the ground of pregnancy, gender segregated labour market, household responsibilities, and challenges presented by a more multicultural society. The active feminists of the 1970's in Norway had four main priorities: (1) the fight for free abortion, (2) the six-hour workday, (3) equal pay, (4) public day care. Only two of these requirements have been met. The debate on 6 hours workdays is now on the rise once more. Personally, I think it would enable both men and women to take part fully in the family matters and ensure a more caring society when it comes to our elders. I hope that it will not take another 40 years to fulfill the rightful Norwegian dream of an equal society where gender does not decide or overrule each person's individual and free choices. Only how, and when, is still the question.